Posted: Thursday, June 11, 2015. 4:59 pm CST. Thursday, June 11th, 2015. BMG: Now-former CEO of the Ministry of Immigration and Nationality, Local Government, NEMO, and Rural Development, Candelaria Saldivar-Morter, was three weeks ago placed on administrative leave. 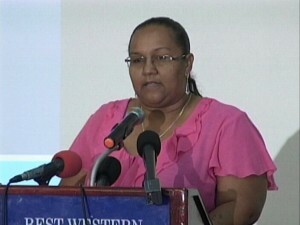 The relative of National Security Minister John Saldivar was a central figure in alleged misconduct at the Immigration Department when Elvin Penner was a Minister of State there, and it was thought that either she was found not to be performing to standards, or else she was being punished for unethical behavior. It is neither; in fact, her former boss, Minister Senator Godwin Hulse, praised her for doing an “excellent job” in the role. The leave is a pre-condition for transfer to another unnamed Ministry. Liaison officer Edmund Zuniga, the former Auditor General, has moved into an acting role as CEO. Hulse noted that no less than six CEO’s have been moved around since the current administration took office in 2012, most notably former CEO in the Ministry of Foreign Affairs Alexis Rosado, who now acts as Belize’s Ambassador to Guatemala. In that case, Hulse says, Rosado was transferred to what is arguably a lower-level but no less important job in an area where he could be “more effective.” He replaced the late Alfredo Martinez.